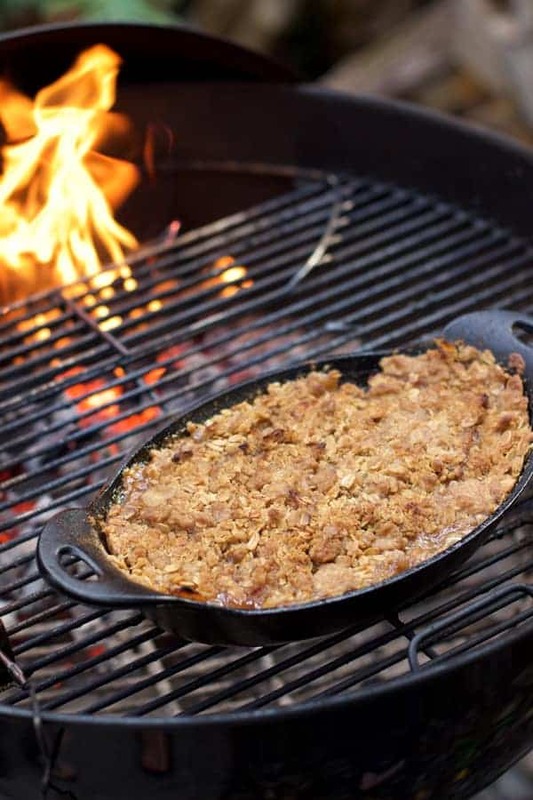 Have you ever wondered if you could cook an apple crisp on an outdoor smoker or grill? Or better yet, if you could attain smoke flavor without owning a smoker? The answer to both of those questions, my friends, is yes, yes you can. Two weekends ago we made grand plans that involved taking the kids out to the scenic Columbia Gorge area to go apple picking. This would, of course, also involve sipping on apple cider, maybe even some fritters, and perhaps even hit up a pumpkin patch. I imagined some frolicking and happy kids and fall foliage. It was going to be one of those perfect fall weekends, like the ones you see your friends posting all over Pinterest and Facebook. Except that didn’t happen. Instead I woke up with a sore throat the size of Texas and a cough like a smoker. The kids were in terrible challenging moods and testing boundaries. One of them began taunting the dog to the point where the next thing I heard was dog growling and kid screaming. The dog scratched the kid, stirring him into a frenzied craze for the rest of the morning (he’s totally fine by the way). Oh, and it was raining. Not really the most ideal weather for frolicking in an apple orchard, even in cute rain boots. We wouldn’t be getting our picture perfect fall apple-picking weekend. But that didn’t mean we couldn’t eat like it. The sun eventually made an appearance and we decided to fire up the grill, and, using apples we already had in the house, decided to make one of our most favorite fall desserts ever – apple crisp. But instead of baking in the oven we cooked it on the charcoal grill. We’ve played around with cooking desserts on the smoker and grill for years and we love it, especially for apple crisp. It gives it a nice smoky outdoorsy element while also thoroughly cooking the sweet apple filling and allowing the topping to get nice and crispy. 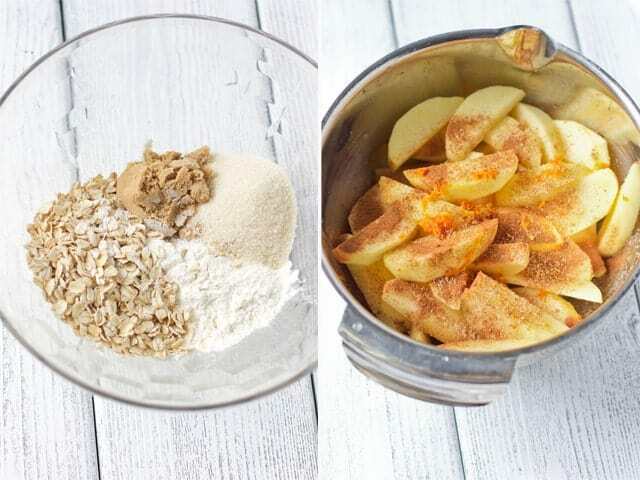 You can also easily cook an apple crisp in your smoker, set to 350-375 degrees (similar to what you would cook it in an oven at), but I find this method is an excellent alternative for those who may not own a smoker but still want to add some mild smoke undertones. We’ve done it both ways. Lately I’ve been a bigger fan of this method. I find the topping gets crispier. 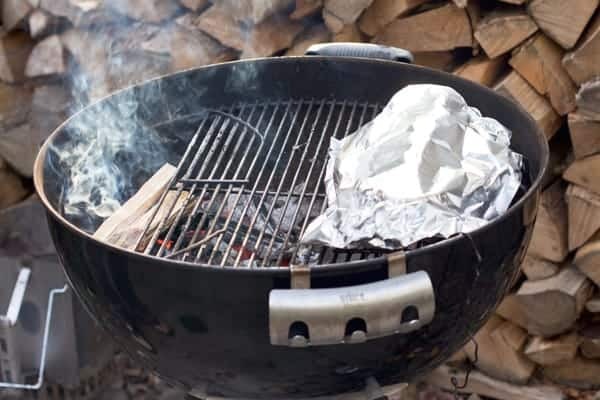 The most important thing to note with a grill (especially a charcoal grill) is that it is difficult to maintain a consistent temperature, so keeping a grill thermometer inside to monitor the temp is a good idea. All you need is some wood chips. You can buy them pre-bagged and cut up, or you can just cut your own from any hard wood. That’s what we did here, with oak. 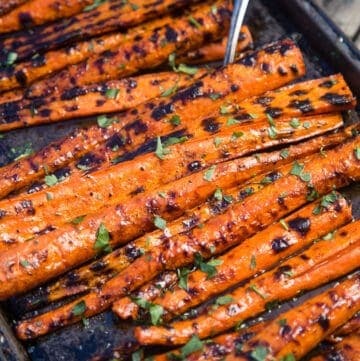 Then prep your grill for indirect cooking. 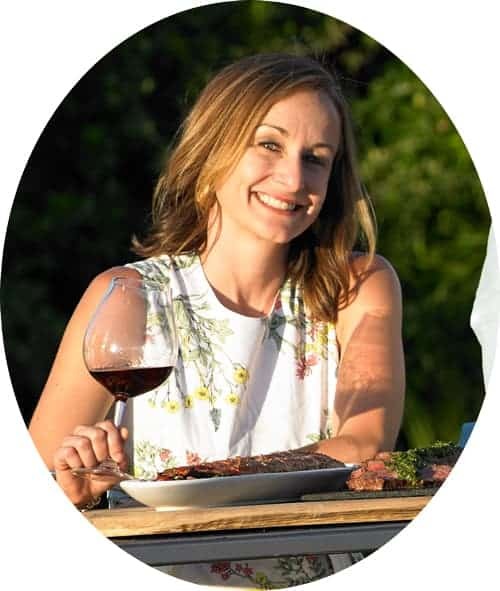 For a refresher on direct vs. indirect cooking see here. 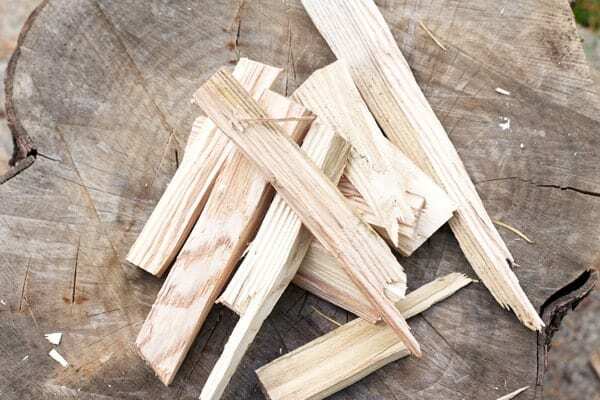 Once your grill is ready to cook add 2-3 wood pieces or wood chips. Then place your baking dish on the indirect heat side, covered with aluminum foil (and make sure it’s a dish that can withstand high heat! We like cast iron for this. The inside of the grill got up to 500 degrees on the indirect side, so use a dish that can handle heat). The foil helps to protect any ash from any flare-ups getting into your dish. You don’t want your apple crisp tasting like ash (take it from me! 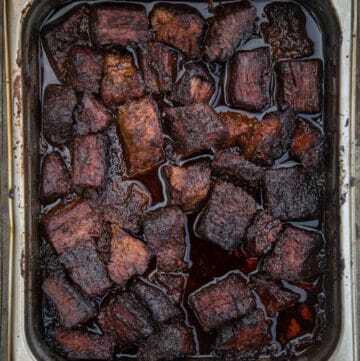 We’ve made that mistake and it ended up making our dish taste like ash, not smoke! Oops). So loosely cover it for the first 15 minutes, until the fire has mellowed out a bit, then finish it uncovered to help the topping get nice and crispy. As far as the actual apple crisp recipe, Ina Garten can do no wrong with her Old Fashioned Apple Crisp as far as I’m concerned. I just love the combination of lemon and orange zest and juice she adds to the filling. The only problem with this recipe (if you can call it a problem) is that it’s MASSIVE! It’s meant for a large group, not a family of four (even a family of four with HUGE appetites). So after years of making this recipe and trying to adjust the measurements (and also reduced the sugar content by more than half, I don’t think it needs it), we finally found proportions perfect for four people. No leftovers here. Bonus: The kids love to help with the mixing! They will also patiently guard the grill so nobody steals the apple crisp when it is unattended. 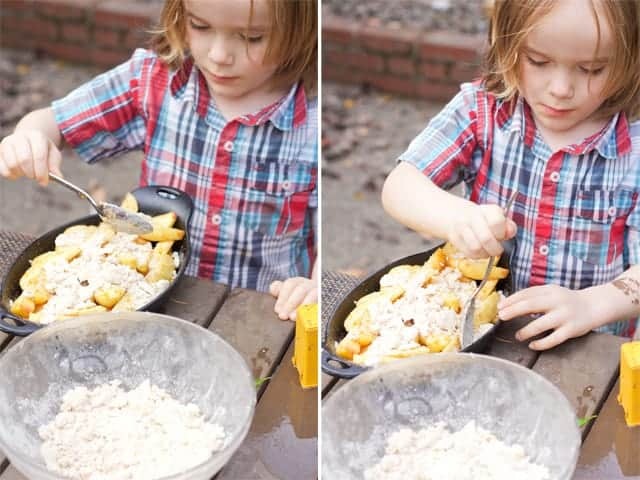 Hey, don’t mess with a hungry four-year-old who’s about to have grilled apple crisp for dinner. Did I say dinner? I meant dessert. (I’m totally lying; we actually ate it for dinner.). We may not have gone apple picking that weekend, but nobody was disappointed after this meal. 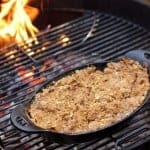 Did you know you can cook an apple crisp on the outdoor grill? 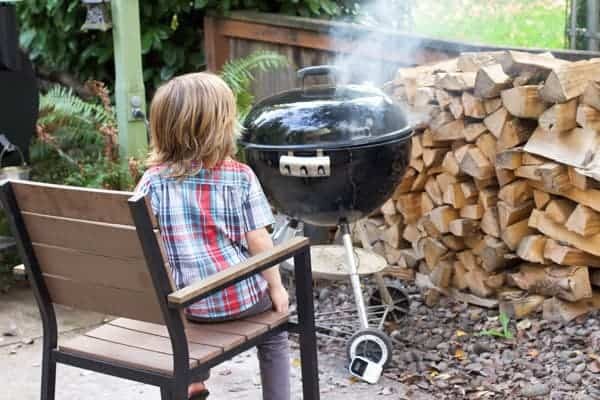 Did you know you can also add smoke flavor by adding wood chips to your grill (without needing a smoker)? 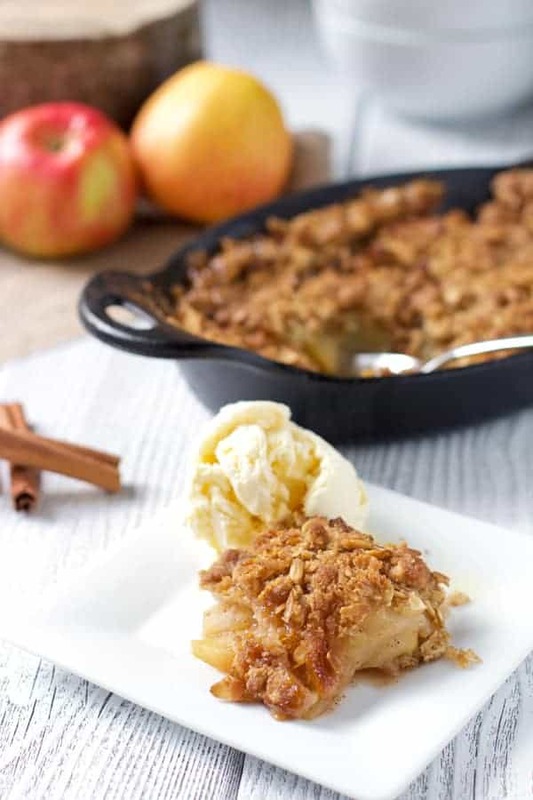 Smoked Apple Crisp is a simple and delicious fall dessert cooked on a grill. And the portions are perfect for four people. Apple crisp recipe adapted from Ina Garten's Old Fashioned Apple Crisp. Preheat and prepare grill to indirect heat. 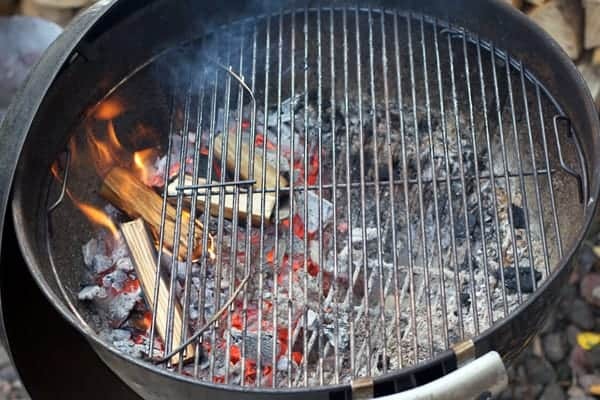 Add 3-4 wood chips to the coals when coals are ready. Cut butter into small cubes then place in freezer while other ingredients are being prepared. In a large bowl, mix together all of the topping ingredients (except butter). When butter is very cold add it to the mix and cut the butter into the mix using a fork (could also use a stand mixer for this, but it works fine with your hands and a fork). Mix together until the mix is crumbly and the butter resembles the size of peas. Transfer the mix to the freezer until ready to pour over the filling. In another large bowl, mix together all filling ingredients. Transfer to your baking dish (remember this is for four portions, so we used a smaller dish. 10x5x2 inch oval cast iron pan works well (approx 1 qt capacity). You can find the exact pan we used below in notes. Sprinkle the apple mixture with the topping mixture and cover with foil. Place on grill on indirect heat for 15 minutes. 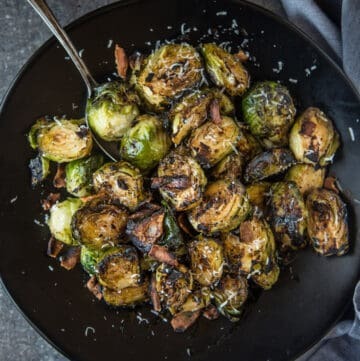 Remove foil, and then continue cooking on the grill for an additional 15 minutes, or until the mixture is bubbly and topping is crispy. 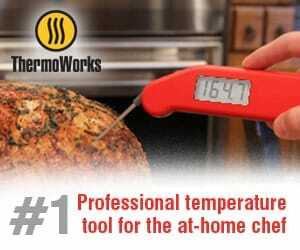 Add wood chips as you see the flame die down, every 15 minutes or so for a handful of wood chips. Serve warm with a big scoop of vanilla ice cream. Notes: We adapted the original recipe in several ways, including reducing the size to feed four hungry bellies. Please note if you’re cooking on a hot outdoor grill to use a pan that can withstand high heat. We like cast iron for this and we used this exact dish for four portions. We also reduced the sugar, as we didn’t find it was necessary. It’s a winner every time! 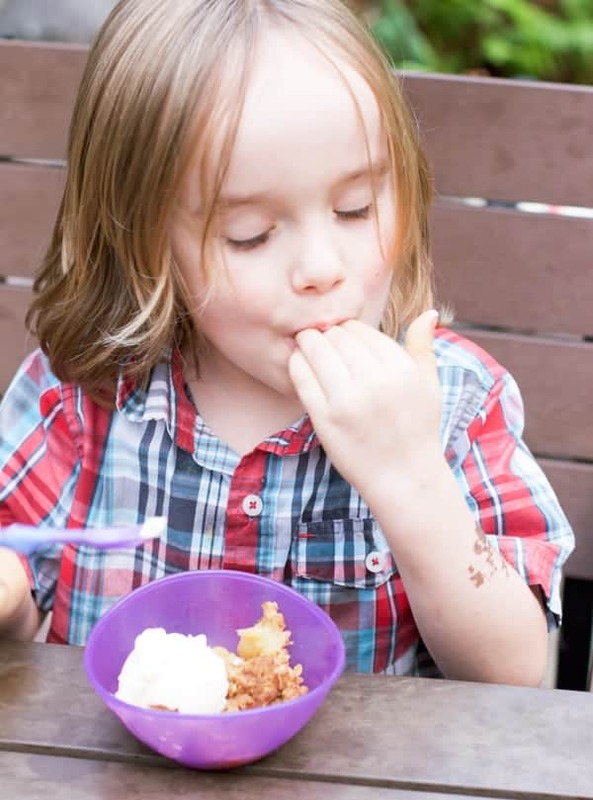 One satisfied smoked apple crisp lover. No apple picking required. 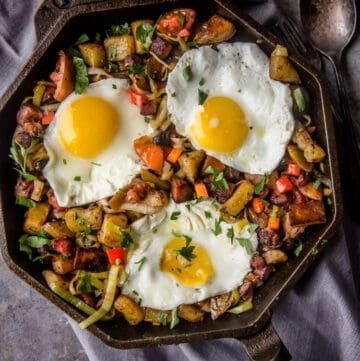 *Disclaimer: This post contains affiliate links for the cast iron dish you see in the picture. That means I receive a small commission if you purchase this dish through amazon. 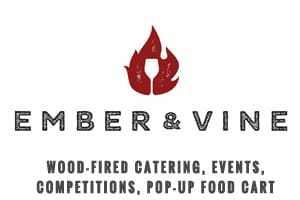 By purchasing through these links you are supporting this site so that we can continue to share more grilling and smoked love! I only recommend products we use (often!) and love dearly. And this pan is da bomb. I love that story!!! It’s totally the way our days go sometimes! I get this great Norman Rockwell idea in my head about the perfect day out and then life happens and the kids turn into….well, kids! 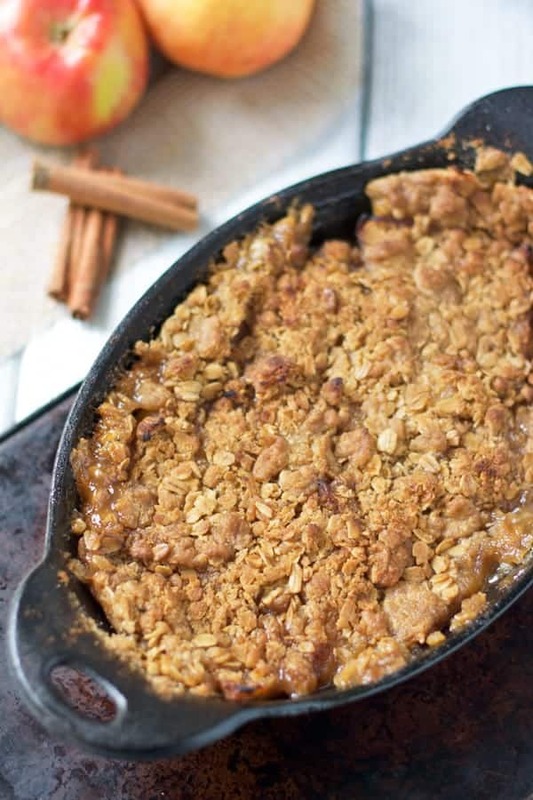 I’m going to make Hubs make an apple crisp on the grill….it looks amazing! Ha! Yes, definitely try it! It’s so fun on the grill. Thanks 🙂 And sometimes unplanned things end up way better than the planned ones!! I hope you get a chance to try this apple crisp. It’s so fun on the grill! This is a brilliant idea! I totally have got to get a smoker for our next ‘big’ purchase. This looks amazing!! Thanks 🙂 And if you ever do want to make the plunge into the world of smokers and need some advice please feel free to reach out! We have 4 different smokers right now (crazy!! ), and would be more than happy to give you some recommendations!! Ooh I’d never thought to make a dessert like this on the grill! I love the photos of your kiddo, and totally get the scenario of dog taunting madness. Boys! We will definitely be giving this apple crisp a try. Smoked apple crisp?!?! OMG, this looks amazing! Smoked flavor? Apple crisp? SIGN ME UP! What a fabulous idea! I love the thought of the smokiness that grill adds to the dessert! This is an awesome idea! I would’ve never thought to put a crisp on the grill! Genius! I can only imagine how flavorful this was! 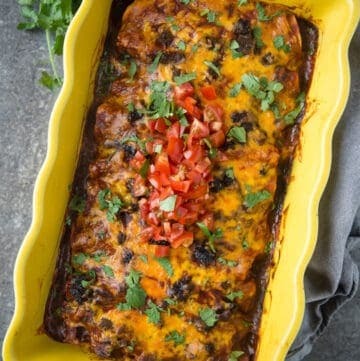 It looks like a recipe that would be awesome to make at a Halloween party tonight! 😉 Thanks for sharing!